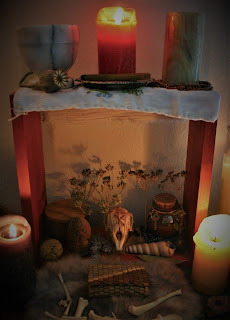 This year, as we welcome the spirits into our home, I welcome so many who have moved on to the otherside. So many candles are lit when working with the spirits, the doorway of the flames offering communication as well as devotion. In those flames are the voices and faces of our ancestors. To me, the Torch-Bearer is responsible for this tremendous gift. Fire is by its nature a capricious thing, but one thing it never seems to fail to do is illuminate a path between us and our beloved ancestors. The art of ceromancy offers a lot of methods and traditions of use, I won't go into them because I speak of pyromancy- the nature of fire gazing itself, whether by candle or woodland blaze- reading the visions within the flames is and old way to sharpen one’s sight, to let one’s mind drift into the light and become illuminated by the dreamy whispers that hiss and crackle from the fire. 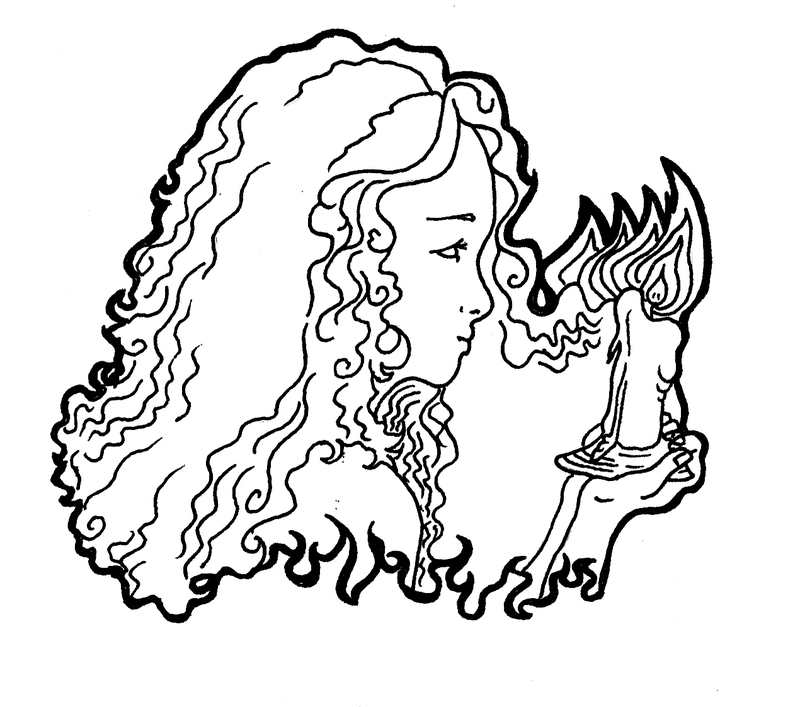 I’ve noticed that when a lot of people write about fire divination, they’re actually talking about smoke or wax divination, rather than pyromantic prophecy. While the movement and sounds, scents and smells of the flames can have a great impact on the divination experience, they aren’t the only way to read flames and celebrate the spirit of fire. It’s true that the movements of flames themselves are important to their interpretation when asking questions, but what of receiving answers from the flames without agenda? Sometimes it’s good to keep some things simple, and the simple act of gazing into flames can be more powerful than trying to analyse their moves with the slightest draft or fickle wick. That’s where my interest lies, in the way our ancestors and we today are drawn to the search the flames for answers. This weekend I spent a lot of time fire-gazing, watching for the dead, and it made me truly appreciate the incredible, hypnotic relief that can come from giving your mind to the flames for a bit, especially as the moon grows full and the nights grow long. Where witchcraft is explicitly concerned, candles were of deep importance in the folklore and traditions of witchery found in Europe and the New World. Where the night-battles were concerned, the witch had a special relationship with the production and use of candles in diabolic or underhanded working, supposedly utilizing gruesome sources of fuel like fat from a baby or the mummified hand of a thief. The prevailing Christian supersticion of the time was that witches were also rumored to light candles as an offering to Satan- just as Catholics light votives to Mary. The symbolic connection between candles and the dead make them a perfect conduit when pursuing the forbidden art of pyromancy. Candles are easy and safe ways to fire-gaze, and that’s usually where I do my seeing. Many peoples and cultures used fire to see visions, including candles, “I have mentioned that in Australia the smoke and flame of the burial fire seem to be used for divination. In Malacca they use the flame of a candle for gazing, and profess to see visions in it.”- Andrew Lang, Crystal Gazing, Its History and Practice (1905). Candles made of the fat of a hanged man made for powerful witches in traditional English magic, and tallow candles have many a traditional use too, as evidenced in Le Petit Albert (1782) which recommends the tallow of a man to form a candle which could locate hidden riches- both these candle types of course are for charms and tricks, not necessarily gazing/scrying. Beeswax candles are cause for the most delight; their scent is sweet and warming and their natural color is radiant. An oil lamp, or lampara is an instrument of petitioning and honoring the great spirits. Lemon, lime and orange fruit lamparas are a standard creation for many servants of the orisha Oshun, but are also perfectly suitable for divination purposes- especially if the oil used for fuel comes from a divinatory source like oil of poppy. Campfires of sacred woods act as great means of divination, merging the steadiness of earth with the transformative nature of the flame, and between them, deep in the glowing red coals one can see their past, present and future- and he who stares into the tall flames may the see the face of their future love. The warm comfort of the fireplace however, this is a special center or heart in the home around which one's ancestors and close allies may gather in the domicilium, the place of safety and home. The gazing of the hearth-fire has been recorded in Northern European folk magic and have made their way to the new world. Those flames always invoke the family spirits. When it comes to seeing into the flames, the color of the candle or the source of the fire isn’t really important, especially not the colors. 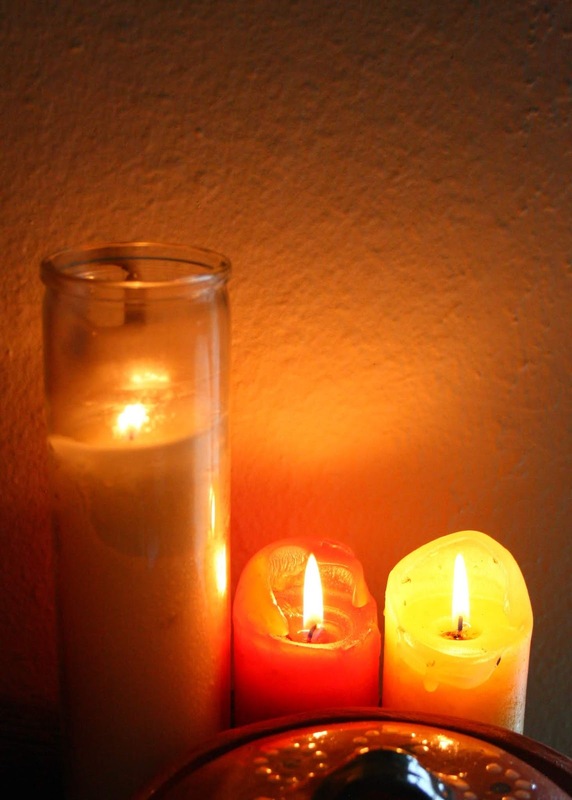 Candle colors serve a great purpose in spell-craft and they do help focus the mind on a goal and set a specific tone of intentionality for a session, but the color does not at all impact the power of the flame nor does it negate the gifts the flames have to offer. A blue or yellow candle won't bring any more or less power to fire divination, only the flames themselves truly matter. 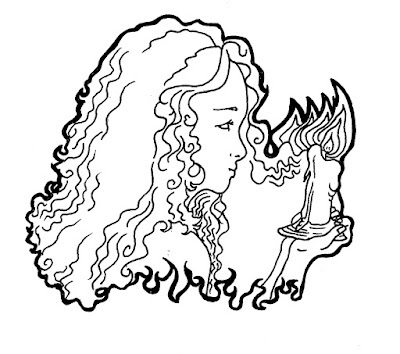 Now, candles made specifically for divination uses, that’s a different matter- the candle is made and intended to guide the connection between the flame and the gazer. Getting candles made with real intention- or making your own, is a great experience and may improve your divination session. Having a specific candle set aside just for divination fosters a relationship between you and the flames that come to burn in that candle. Fire, is the thing of spirit, and at Samhain/Halloween especially, that spiritual power is a thing of deep symbolism for so many all over the world. Now is the best time of year to spark the flames and gaze into them, letting the spirits dance before your eyes and whisper in your ears. Seeing into flames, we watch for the shadows between sparks and the waves above; we time the flickers and the change of colors and watch it trick us, hypnotize us. Most of us who grew up attached to the outdoors know well the feeling of being fireside at night, in nature, in the dark. The sparks drifting through the dark canopy above, the way the cinders glowed like gems and flickered passing fantasies and visions. Gazing into the fire doesn’t mean you’ll see the truth- most often you’ll only see what you want to see, but we gaze anyway because the fire speaks to the witch. Whether your flame was lit for the angels, ancestors or the devil itself, the spirit you summon with the spark of life is a doorway, and when we gaze, we fall through- even for flickering moments.